When you’re young and you care about something enough, you never truly let it go. 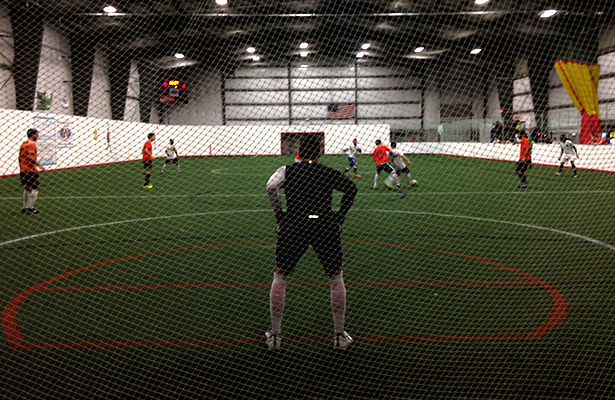 For me, the Holiday Indoor Soccer Tournament serves as annual reminder of that axiom. Despite Flinstones jerseys and goofy team names like the “Knuckle Pucks,” the Holiday Indoor Tournament likely boasts the highest level of amateur soccer in the state of Oregon. The tournament is an annual one-day, one-field soccer tournament that for many Oregon soccer players has become as integral with the winter holidays as pumpkin pie and hot chocolate. The tournament is special. For the participants, the attending parents, and friends, the tournament offers a window back in time to a world extinguished for its participants, the world of competitive youth soccer in Oregon. Old and bitter rivalries have long been forgotten in the rubble of the past and new alliance and friendships have been built in their stead. For me, the tournament is the greatest soccer tournament in the state of Oregon and it represents the values that give the beautiful game its name. Maybe that is why the best of Oregon’s graduating ranks; players like Danny Mwanga (Rapids), Eric Hurtado (Whitecaps), Dustin Corea (Skive/El Salvador NT), and Chad Barret (Flounders) enjoy playing in it so much. This year’s tourney was played Sunday, Dec. 29 at Tualatin Indoor Soccer Center, and at a general level, works like this: There are twenty teams that are divided into four groups and the top two teams of each group will advance to a single elimination playoff bracket (round robin group play). Each game has a running twenty-two minute clock and teams receive bonus tournament-points for scoring more goals. Because of the short clock and high reward for goals, the tournament is well known amongst its participants for its open, offense oriented tactics, even by indoor soccer standards. Each team is guaranteed four games in group play and could play as many as seven games in a single day by making it to the championship. Accordingly, it has become customary for teams to work with a roster with ten or more persons and subs are often in and out at two minute intervals. Although surely any player could testify to the physical toll the tournament takes, there are two particular individuals that may be classified as star witnesses. Despite the presence of professionals in the tournament year after year, the most recognizable figures are the two referees who are there for the first game at eight in the morning and only hang up their silver whistles after the championship match, just shy of midnight. Eric Beck and Juan Barone have been refs within the Oregon soccer community for longer than I can remember. They have borne witness to the development of elite young players in our state and can talk fluently about the ebbs and flows of tactics, systems, coaches, and players that played here. After the final whistle of the championship match you can find the pair at the facility bar drinking a well deserved beer that hopefully washes away some of the nastier verbal objections to the day’s controversial calls. I caught up with Eric and Juan after the final match. When I asked them about this year’s tournament they said, nearly in unison, that this year was the best quality they had seen overall. This conclusion was remarkable given that a legendary Holiday team had finally called it quits and was absent from the year’s tourney. The team, lead by Chad Barrett, was feared, and known as the Rangers. Their all-black uniforms and quick, technically sound passing lead them to a sort of Holiday Tourney dynasty. Despite their absence, the quality of this year’s tournament was superlative. After group play, nearly every team consisted of rosters brimming with current and ex-college athletes, with many of them having played Division 1 soccer. Notable teams included the Internationals, a Westside Metros based team lead most notably by Eric Hurtado. The Internationals were one of the youngest teams in the tournament and they put up a good fight in the quarter-finals although the older, stronger Young Money got the better of them by a single goal. In the semis, the Flintstones, a team hilariously sporting the archaic garb of their idol namesake, Fred, edged out El Crew, a dynamic team lead by 2006 Oregon player of the year and ex U.P. talent Frankie Lopez. 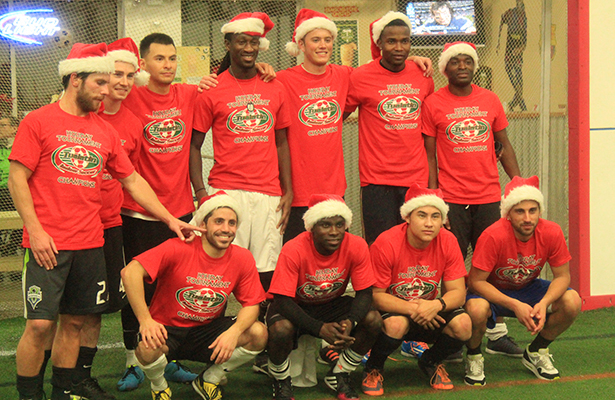 The game was decided on penalties and the Flintstones advanced to seek their second tourney title. On the other side of the bracket, the Knucklepucks, lead by the three Phillips brothers and having been undefeated in group play, met their match against Young Money and handily lost 4-1. The victors employed a successful high pressure, man-for-man defense and found three of their goals from consequential turnovers (one such turnover came from the author of this article). The finals produced a wonderful match. It can best be characterized as a high intensity game with brilliant finishing. Young Money again applied high pressure and were rewarded with greater possession, however, the double sided sword of high, man-for-man pressure allowed the Flinstones to find the net after well executed two-against-two opportunities were created. As is often the case at the holiday tournament, there was the hint of a crowd and the atmosphere seemed to intensify the game further. The difference between the two teams came from the two participating professionals. After a clinical finish from Danny Mwanga, Dustin Corea pounded two fantastic goals into the net to secure the 3-2 victory. After the game, Mwanga remarked on the impressive quality surrounding the games and stated he was happy to come out on top. Mwanga also advised that often the key to indoor victories simply comes down to the finishing and that he believed his team had bested in that category. I was able to observe Danny, years ago, as he came up through the Westide Metros ranks, and even in those youthful performances his deep competitiveness greatly complimented his natural strength and skill. That same competitiveness showed in the Holiday Tourney. After the game, Danny told me about how his MLS coaches had instructed him to be careful to stay injury free but if there was any let down I couldn’t see it. In the thirteenth minute of the championship match, after an opposition goal by Jarad vanSchaik (USL Pro Charleston Battery), Danny could be heard yelling out, “Have to get the subs going, we need to stay fresh!” Danny told me he loves participating in the tournament because there is no pressure and it’s a great chance to express yourself on the field. Although Young Money was the only team to take the medals and the santa hats, the tournament offered us all a second shot at the dramatic turbulence of the irrecoverable glory days. For me, it was a reminder of all the things that made soccer matches so special. Too often professional soccer is marred by ugly blemishes in the form of ridiculous diving, absurd squabbles over gross salaries, and an emotional disconnect between the players and the fans. The Holiday Tournament is a reminder that the sport is about so much more than is on the pitch. It was validation of the strength and success of the Oregon Youth Soccer system and the community created through it. Both on and off the pitch there was a fraternal feeling permeating the indoor complex and through it a reassuring notion of why we all love the beautiful game. He says he is excited about next year’s event, the 12th annual tournament, and believes it will continue to grow in competitiveness. As always, it will be held in late December so that those visiting home for the holidays can play once more with old friends from the football pitch.